Shopping for a new Audi Q5? The base Q5 Premium comes well-equipped from the get-go with a 7.0-inch infotainment screen and leather seats; do you really need more? The Audi Q5 is certainly the segment's most modern offering, delivering a high degree of technology, comfort, and conservative style. The 2018 Audi Q5 is a luxury compact crossover SUV that squares off against tough competition. Luxury crossovers are popular and pricey, and shoppers have multiple options from Mercedes-Benz, BMW, Jaguar, and Lincoln, just to name a few. The Q5 is new for 2018 and equipped with a 2.0-liter turbo-4 that sends power to all four wheels. A performance-oriented SQ5 offers 354 hp from its turbo V-6. 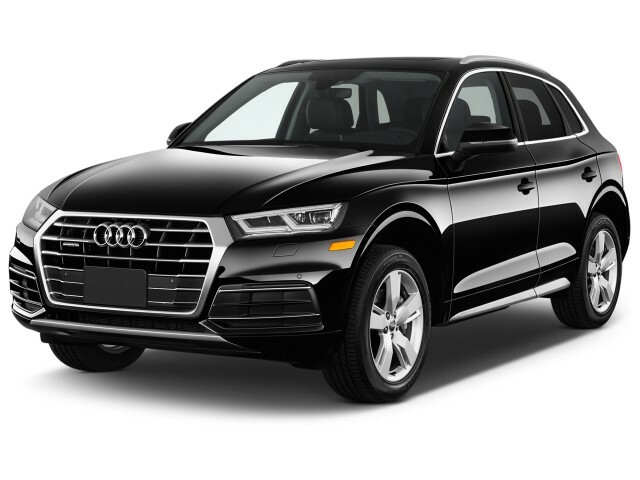 The Q5 is available in Premium, Premium Plus, and Platinum trim levels, with a fairly high degree of customizability within those three variations. It may not look all that different for 2018, but the Q5 is all-new underneath. Its exterior follows Audi's more sinewy design language that emphasizes a shapely belt-line and a nose that appears longer than before. The difference is mostly in the detailing, with standard HID and optional LED headlights projecting the way forward and flanking the latest version of Audi's shield grille. At the rear, the Q5 sports a tailgate that could have been carried over from last year, but new LED lighting cleans up its rear lights. SQ5s, meanwhile, have a slightly revised look outside with their own alloy wheel designs. Bigger changes come inside, with the Q5 gaining the automaker's latest interior design language. Unlike some Audis, its central display screen doesn't retract when not in use, meaning it looks something like a tablet computer held on via an aftermarket clip. It's a rare wart in an interior that is otherwise soothing and logical. Switches are organized in a single panel below the climate control, but all infotainment controls are via a big touchpad that looks like it belongs on a Dell laptop. Higher-spec models get Audi's Virtual Cockpit that replaces conventional gauges with a configurable LCD screen. 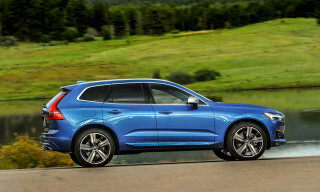 Underhood, the Q5 once again sports a 2.0-liter inline-4 as its base engine, but it has been upgraded to the automaker's latest unit. Nearly the same engine that also powers the larger Q7, the Q5's engine works well in this smaller application. 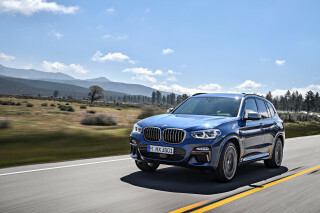 It's mated exclusively to a 7-speed automatic and standard all-wheel drive, which now disconnects the driveshaft going to the rear wheels to save fuel in most situations. Unlike rivals, however, Audi's system spins up in a fraction of a second to apportion power rearward when needed, and it can sense when a driver is beginning to encounter adverse conditions that require a little extra traction. The SQ5 makes use of a new turbocharged 3.0-liter V-6 fitted to the latest S4 and S5, with peak output rated at 354 horsepower and 369 pound-feet of torque. Mated to an 8-speed automatic and driving all four wheels, the engine hustles the SQ5 from 0-60 mph in 5.1 seconds. The latest Q5 rides on a new platform modular shared with the A4, which endows it with a big upgrade in structural rigidity. It's not substantially lighter than the outgoing model, despite more use of aluminum and reduced weight for its all-wheel drive system. More standard and optional features, plus additional sound deadening keep it right around 4,000 pounds for the Premium trim level and slightly higher with more features added on. The Q5 only grows slightly longer despite its new architecture, but Audi has been able to carve out a little more room for the second row. It's now as comfortable as any competitor, allowing two 6-footers to sit behind other 6-footers. The middle seat, as in most compact crossovers, is best for kids or for occasional adult use. Up front, there's good room for two, with comfortable seats swathed in leather on all models; most rivals clad base models in leatherette rather than real hides. The cargo area is nicely finished, and the rear seats fold down with ease, but they don't create an entirely flat load space. On the safety front, the Q5 hasn't yet been tested by the IIHS or the NHTSA. Available features include adaptive cruise control that can bring the vehicle to a halt in heavy traffic and then automatically start it back up, as well as automatic emergency braking. One new, optional trick is that it can detect when vehicles are approaching and it will alert passengers if they're about to open the vehicle's doors into traffic. Audi offers the Q5 in three trim levels, each of which is well-equipped. Base Premium models come standard with leather seats Premium Plus models add a panoramic moonroof that, unfortunately, has a shade that doesn't fully block out the sun, as well as memory seats and some safety tech like blind spot monitoring and rear automatic braking. The range-topping Prestige goes fully decadent with 20-inch wheels and a Bang & Olufsen audio system. The new Q5 looks rather like its predecessor, but its interior is gorgeous. At first glance, the new Q5 looks a heck of a lot like its predecessor, which is either good news or bad depending on your perspective. Its exterior follows Audi's more sinewy design language that emphasizes a shapely belt-line and a nose that appears longer than before. The difference is mostly in the detailing, with standard HID and optional LED headlights projecting the way forward and flanking the latest version of Audi's shield grille. At the rear, the Q5 sports a tailgate that could have been carried over from last year, but new LED lighting cleans up its rear lights. The SQ5 features some slightly different exterior trim and its own alloy wheels, but it'll take someone pretty familiar with the brand's lineup to spot the differences. If there's an older Q5 in your garage already, don't expect your neighbors to notice when you bring home the new model unless you opt for a different color. Bigger changes come inside, with the Q5 gaining the automaker's latest interior design language. Unlike some other Audi models, its central display screen doesn't retract when not in use, meaning it looks something like a tablet computer held on via an aftermarket clip. It's a rare wart in an interior that is otherwise soothing and logically arrayed. Switches are organized in a single panel below the climate control, but all infotainment controls are via a big touchpad that looks like it belongs on a Dell laptop on models equipped with navigation. Here, too, the SQ5 gets a few special touches: sportier seats, red stitching, and available carbon fiber trim. Higher-spec models get Audi's Virtual Cockpit that replaces conventional gauges with a configurable LCD screen, for a fully high-tech experience. There's not a more advanced interior in this segment. We like that Audi has made leather trim standard even on the base Q5, and it's even available in an attractive brown shade. Audi's all-wheel drive system is especially good, but we're also happy with the Q5's base 4-cylinder. Just one Q5 powertrain is on offer for 2018, but it's a good one that mates well to the model's new, stiffer platform and its refined suspension. 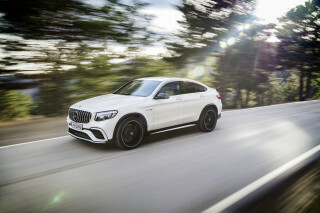 Underhood, the standard Q5 once again sports a 2.0-liter turbo-4 as its base engine, but it has been upgraded to the automaker's latest unit. Nearly the same engine that also powers the larger Q7, the Q5's engine works well in this smaller application. The engine is rated at 252 horsepower and 273 pound-feet of torque, improvements of 38 hp and 15 lb-ft over the outgoing model. Combined with a curb weight that's essentially unchanged (officially down 45 pounds on the base model, but a panoramic moonroof is now optional instead of standard), the Q5 feels more robust than ever before. 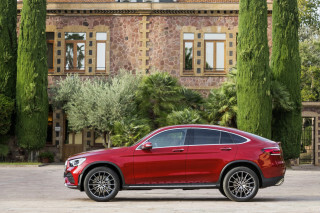 The 4-cylinder is mated exclusively to a 7-speed dual-clutch automatic and standard all-wheel drive, which now disconnects the driveshaft going to the rear wheels to save fuel in most situations. Unlike rivals, however, Audi's system spins up in a fraction of a second to apportion power rearward when needed, and it can sense when a driver is beginning to encounter adverse conditions that require a little extra traction. The latest Q5 rides on a new platform modular shared with the A4, which endows it with a big upgrade in structural rigidity. It's not substantially lighter than the outgoing model, despite more use of aluminum and reduced weight for its all-wheel-drive system. The company's Drive Select system includes five modes of operation—Auto, Sport, Individual, Comfort, or a new Off-Road mode. Each features a subtly distinctive feel, but the off-road mode doesn't do much here; foreign markets are offered an air suspension that goes up for more ground clearance, but that feature is only available here on the SQ5. What most impresses us most based on our initial time behind the wheel of a Q5 Prestige is how little engine, road, or wind noise makes its way into the serene cabin. Even at triple-digit speeds, it's a silent, refined performer with excellent straight line stability. Turn up the wick and the Q5 remains poised through the twisties, but its steering is light and delivers limited feedback. It’s clear from the first curve that this is not a corner carver, though its handling is safe, confidence-inspiring, and about what buyers in this segment have come to expect. 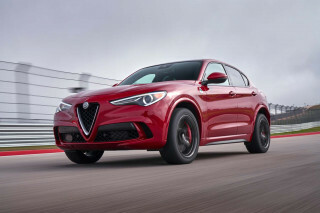 The available adaptive dampers do little to significantly tighten up the car’s dynamics, though even left in their firmest mode with the optional 20-inch wheels, they silently isolate the outside world’s imperfections. The Q5 doesn't offer an air suspension—unless it's called an SQ5—but we didn't particularly miss it on base SUVs last time around. 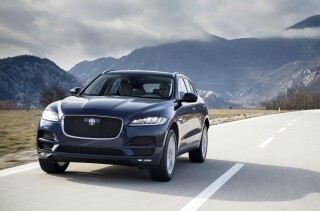 As it is, this model is decidedly comfort-oriented, which should suit most consumers fine. We spent some time plowing through sand and a rough dirt road in the Q5 and can report that its interior remains undisturbed by even the roughest washboard roads. The automaker's new Quattro Ultra system imperceptibly sends power to the rear wheels when needed. We're looking forward to sampling it at some point on an icy or snowy road, but it was unfazed by deep sand. Boasting an upgraded air suspension and a turbocharged V-6 that makes 354 hp and 369 lb-ft of torque, the SQ5 is a performance-oriented version of the Q5 crossover—if there were such a thing. It catapults the 4,400-lb. machine up to 60 mph in 5.1 seconds thanks to a speedy 8-speed automatic and all-wheel drive. An available rear mechanical limited slip differential can reroute power to the outside wheels in cornering to keep the SQ5 bright and light on its feet, despite its prodigious weight and frame. The standard air suspension lowers the SQ5's gait 1.2 inches from the standard 8.2-inch ride height on the Q5. Different settings on the SQ5's adjustable suspension can raise or lower the machine for off-road or sportier drives—or perhaps the driver's mood. Mash the throttle and the SQ5's V-6 stands at attention, but only from twisting the dial into "Dynamic" does the SQ5 come alive. In our drives in and around Vancouver, British Columbia, we found that the SQ5 had performance bona fides, and could quiet down all the same. The ride on optional 21-inch tires felt flinty, so we'd recommend the 20-inchers to save backs and bank. Beautifully detailed, the Q5's interior is among the best in its segment. Even the base Audi Q5 feels high-buck inside, thanks in part to standard leather trim, but things only get better when you start piling on the options. Up front, there's good room for two, with comfortable seats swathed in leather on all models; most rivals clad base models in synthetic leather rather than real hides. Optional wood trims in glossy and matte finishes are available and, following Audi tradition, are reasonably priced. The Q5 only grows slightly longer and a couple of inches little wider despite its new architecture, but Audi has been able to carve out a little more room for the second row. It's now as comfortable as any competitor, allowing two 6-footers to sit behind one another. The middle seat, as in most compact crossovers, is best for kids or for occasional adult use; and that's obvious since the outboard seats are deeply scalloped for just two. At the rear, the cargo area is actually about half a cubic foot smaller than before with the second row of seats upright, but it adds almost three cubic feet when those seats are folded forward for maximum cargo hauling. The rear seats are split in a typical 40/60 arrangement, and they fold manually at the pull of a lever. Unfortunately, the cargo area isn't entirely flat when they're down. The 2018 Audi Q5 earns top marks from federal and independent testers. 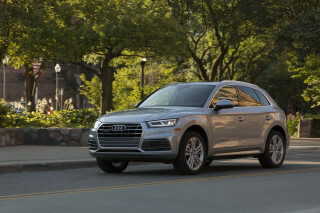 The 2018 Audi Q5 has earned top marks from federal and independent testers. The Q5 is gifted with better outward vision than the outgoing model thanks to large side mirrors, rear seats that don't obstruct the view rearward, and narrow roof pillars. However, the belt line is higher than some competitors, meaning it can have a little more of a bathtub-esque feel behind the wheel than we usually like to see. 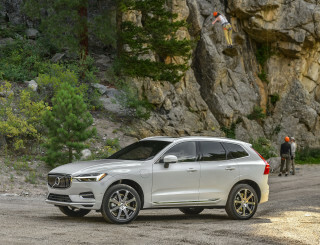 All Q5s include the expected airbags and stability control, plus a system that begins closing windows and the optional moonroof if it detects a collision, and they can also automatically brake to prevent a collision or mitigate its severity at speeds below 52 mph. Big options include adaptive cruise control that can slow the vehicle to a halt and then start it up again in a traffic jam, as well as blind-spot monitors, rear automatic braking, and rear cross traffic alert. For urban dwellers, one nifty new available feature is a system that blinks a light on the door panel when it detects a vehicle or bicycle heading toward the vehicle before the door is opened—useful in a parallel parking situation. The base Audi Q5 is so well-equipped that we would be satisfied with it. The 2018 Audi Q5 starts at $42,475, including a mandatory destination charge, which represents a small increase over the outgoing model from last year. That means it still offers a lot of value for the money and a wide range of optional technologies. The range starts with the Premium trim level before jumping up to Premium Plus and range-topping Platinum models; Audi expects that the Premium Plus will be the most popular. But that doesn't mean that the base model is stripped out. The Premium includes niceties like power-operated front seats, power windows and locks, a proximity key, and a decent audio system. It also includes some surprises: leather upholstery is standard, as are xenon headlights, a satin finish roof rack, and lower speed automatic emergency braking. The Premium Plus model adds a power panoramic moonroof (which was previously standard on all models), plus LED headlights, blind-spot monitors, and automatic braking when backing up. The Prestige model goes full-tilt with 20-inch alloy wheels, 19-speaker Bang & Olufsen audio, and more. Among the myriad options available, the true standout is what Audi calls its Virtual Cockpit. It's a 12.3-inch display screen that replaces the conventional analog gauge cluster. While it can be set to display digital gauges, it offers numerous pages capable of displaying everything from Google Earth-derived navigation to full audio controls. The system integrates perfectly with Audi's MMI infotainment system, which includes its own laptop-like touchpad just ahead of the gear lever. The Audi Q5 is relatively efficient for a spacious crossover. The 2018 Audi Q5 manages 23 mpg city, 27 highway, 25 combined, according to the EPA. Most rivals offer a more fuel-thrifty two-wheel drive model, something Audi doesn't do. 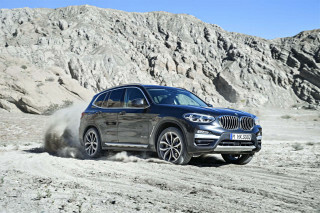 However, the company's latest all-wheel-drive system is designed to address what's normally a hefty fuel economy gap. The high-performance SQ5 manages 19/24/21 mpg, according to the EPA. Disappointed with the ride and seat comfort. Has a great new look, awesome interior, has many safety features. Competitiors like Mercedes, inifinit, and BMW have basic interiors.